Adventurer, Steve Backshall, visits CubJam and reveals an unusual Birthday Cake to celebrate 100 years of Cub Scouting. ‘CubJam’, the biggest Cub Scout camp event in 10 years, took place last week at Gilwell Park Activity Centre, one of many events in 2016 that is celebrating 100 years of Cub Scouting. 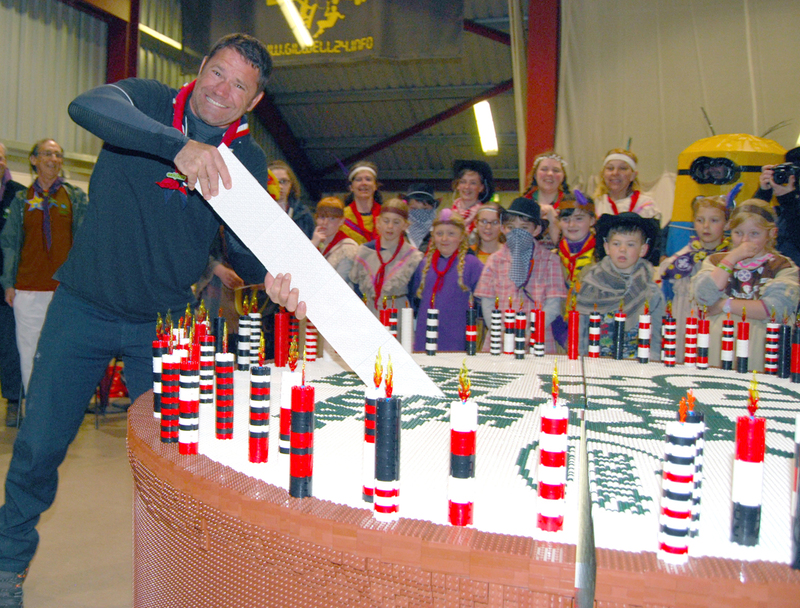 To mark the occasion, The LEGO Group sent the UK’s only LEGO Certified Professional builder, Duncan Titmarsh, along to construct a rather special celebration cake, made out of 22,000 LEGO bricks. This was no mean feat and so he enlisted the help of Cub Scouts to take part in building the top of the cake, complete with 100 LEGO candles. Cubs 100 Ambassador, Steve Backshall, dropped in for a slice of the action, and helped to ‘cut’ the finished cake with a group of Cub Scouts! Attended by 1200 young Cub Scouts from across England and Wales, CubJam has been organised by a host of adult volunteers from across the UK.